You can check all the entries you have submitted in any contest you have participated in from each contest page by clicking a single button "Check Domain Availability". You only have to click this button once, and it will check all your submitted names for that contest at the same time. Once you perform a check on your names, the availability results will be displayed next to the name, and you will be able to see them at any time. On "My Entries" page, you will be able to check all your entries in bulk by clicking on the 'Check Domain Availability' button. As you scroll down your list of entries, the system will automatically check the domain availability for all the entries. If any of those entries are no longer available a red circle icon will appear. This way, you can report any registered domains much easily and without having to recheck every name individually. 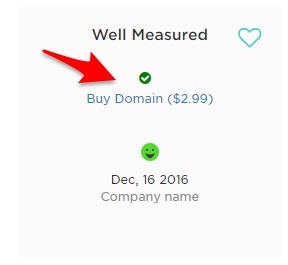 If a green check mark icon appears next to the name, the domain name is available. We have setup a direct link with GoDaddy so that the Contest Holders and Creatives can directly purchase names by clicking "Buy Domain" next to the entry. Learn more about Domain Purchasing for both Creatives and Contest Holders. 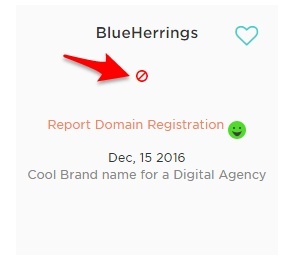 If a red circle error icon appears next to the name, the domain name is unavailable. If you suspect that one of the names you submitted in a contest has been registered by the Contest Holder, you can report it to Squadhelp for investigation. We have setup a clickable link underneath the entry to Report Domain Registration. Please Note: You will be able to perform another check for the same set of names after 12 hours (of last check). The 12 hour limit is to ensure that we do not end up doing excessive number of availability checks, since you can now check for names in bulk.